The peripatetic paddlers are at it again. 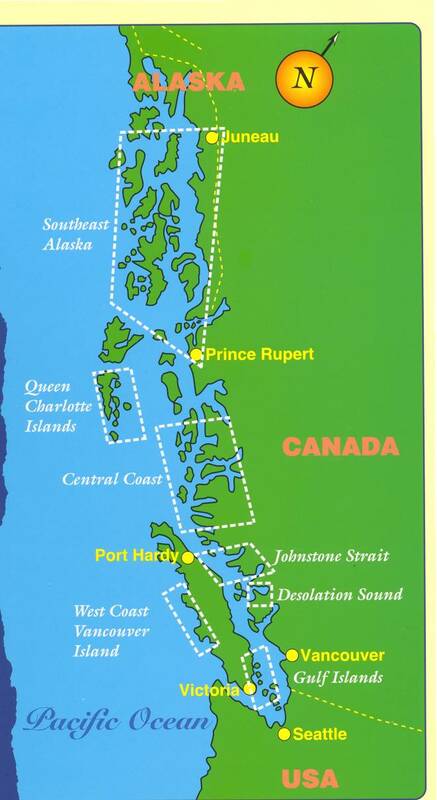 This time they convene on the backwaters of the Inside Passage between Vancouver Island and the British Columbian coast. As an explanation for the reader, the adjective peripatetic is derived from Greek and was applied in ancient times to the school of Aristotle, where the scholars would walk up and down during their discourses. In our case, it is applied to paddlers who go from place to place maintaining a nearly continuous discourse on matters biological, geological and political. At other times it has been used more descriptively, such as that pair of pathetic paddlers but I won’t go into that now. This time our group of peripatetic paddlers includes Peter and Jane from Madison, Wisconsin, Frank and Mariana also from Madison, Nathan from Boston, Don from Regina, Saskatchewan, Nancy from Seattle, Jennifer from Vancouver, and Kris and Shanna from Diamond Springs, California. We all booked passage on the Mothership, Columbia whose crew includes Captain Bill, First Officer Sharon, and Lorna, the resident naturalist. Columbia is a 68 foot long motor launch that was built in 1956 to be a missionary and hospital ship for the Anglican church. It functioned in this manner during the 1950s and 60s, serving the isolated native villages and logging camps along the mid portion of the coast of British Columbia. Captain Bill purchased it about 10 years ago and has refurbished it with an eye to maintaining the elegance of its heritage and to provide the safety and comfort expected on modern vessels. The Columbia is assisted by a fleet of kayaks (mostly tandem ones) and a jet powered skiff. It has been functioning in this capacity of Mothership for kayakers for the past 6 years. Our group of paddlers meets at Port McNeill, just north of Port Hardy, on the north end of Vancouver Island, on Sunday afternoon, August 22, 1999. The Columbia is at the marina loading up with supplies. The paddlers arrive by car or taxi. Port McNeill is a hard place to get to, but our adventurers negotiate these challenges in fine style. Several of us stop at a local dive to have some food prior to boarding the boat. We are met with very slow and rather incompetent service, an unusual feature for this area. We mark the place as one to avoid on all future visits. At 5 PM, we load our many bags, all soft sided, aboard the Columbia and inspect the ship. The ship has a large covered back deck, walkways on both sides of the main cabin, and a smaller front deck. The main cabin has a large carpeted room for dining, reading (library present) or relaxing by the gas burning metal stove. There is a large First Nation (latest term for native people of Canada) ceremonial mask of a raven hanging on the wall in this room. Just in front of the main lounge is the kitchen. In front of that is the pilot house and map room. Below the main level are three cabins in the aft section of the boat with one head and shower combination. Each cabin can accommodate two people. In the forward section there are also three cabins – two for guests and one for the captain. Additionally, there is a small central room, which used to be the chapel. This room now contains a couple of bunks for the crew, some storage, and a head with a shower. The third head is in the foremost cabin. The engine room is between the fore and aft cabin sections. The ship has been refitted with wood decking and beautifully finished teak railings. It is painted white with dark green trim. The kayaks are stored on the deck above the main cabin. One of the rigging devices on this deck is a boom that lowers the kayaks from deck to water and vice versa. Other devices on this deck are for radar and communications. The ship feels secure and comfortable. The only shortcoming is limited head clearance for guests over six feet tall. We launch into our adventure about 5:30 PM. Our first leg is from Port McNeill to the harbor of Alert Bay on Cormorant Island, a spot along the Broughton Strait of the Inside Passage. As we cross the channel, we have grand views of snow capped mountains both on the mainland of British Columbia as well as on Vancouver Island. We spot the five–pronged peak named Mt. Stephen to the north on the mainland. The village of Alert Bay (population about 700) has a dominant First Nation influence. Approximately half of the population are descendants from the Kawkiutl people. We moor the ship in the part of the harbor that serves the fishermen of the First Nation. Bill suggests that we walk through town and see the First Nation cemetery. We do so. Our first wildlife sighting is a pair of bald eagles flying among the trees overlooking the harbor. There is also a native dugout canoe, about 30 feet long, moored here. As we walk through town we are greeted by the local people who seem to be spending a leisurely Sunday evening on their porches or in small groups along the main street. The First Nation cemetery is on a hillside overlooking the harbor, facing the setting sun. The cemetery has many totem poles. Two recently painted ones seem to be markers for the cemetery itself. Others are more weathered and even in a state of disintegration. These are markers for individuals or families and are meant to decay. The setting sun provides a mood for viewing these works of art and expressions of religion. We have enough information to identify some of the carved figures – such as the raven, thunderbird, bear, frog and a few others. The lowest figure on the totem represents the person who is buried there. But full appreciation for the totem’s story will require further study. We return to the Columbia after sunset and have an informal gathering that includes fruit, cheese and bread. We talk and begin to get acquainted with each other. Our group consists of energetic people who are all interested in learning about this area, interacting with the natural world and participating in this group activity. While the specifics of our backgrounds and activities are quite different, the general themes of our lives and interests are remarkably similar. For some obscure reason, our conversation travels from the recent earthquake in Turkey, to the last great earthquake in Anchorage, Alaska, and to the possibility of a Tsunami tidal wave in this area during this trip. I think the gist of this conversation was, don’t worry about events in the rest of the world, because a Tsunami is coming and will carry us away. With this in mind, we go off to bed about 10 PM, and have a peaceful night. The Mothership is securely moored and makes no rocking motions or bumps in the night.